Social media is now part and parcel of daily life for the majority of businesses these days and it is so important that those businesses can engage with their customers/followers. One way dialogue never works and there is no faster way of losing interest that a steady stream of blah blah blah. So, what is the answer? Engaging with followers, make sure dialogue is 2 way and that it is a conversation. Answer questions or queries, give people something to talk about but stay away from anything too controversial. Consumers talk about companies on social networks: every day conversations about brands are shared on sites like Twitter and Facebook. Large companies are hiring people to observe those conversations and to talk back when it’s necessary to do so. Many small businesses are looking at this trend and are wondering how they should deal with it. The online conversations still look scary for some smaller companies, as they might well do for larger companies as well. Here are some guidelines for small businesses in this new marketing field which should help you to get started. If a customer starts a conversation with you, focus your attention clearly on what that person has to say. A consumer can approach you through a number of different channels – e-mail, face-to-face, in a community and so on. Whichever channel they use, if they have taken the trouble to contact you, it means that it is important to them. You must therefore listen to the individual patiently and attentively, even if they are saying negative things about your company. Most companies are afraid that online conversations are mainly negative. This is not the case; the majority are positive. In fact, in a small organisation, it’s beneficial to share the positive comments of clients with employees. In order to understand the commenter properly, it may be necessary to ask a number of questions. Perhaps your first instinct is to counter-attack, by showing them the weaknesses in their arguments. This is a bad move, which only leads to frustration, and does nothing to solve the problem. By asking questions, the customer will feel that you are showing genuine interest. Social media is now a major tool in the online marketing armoury and making use of it effectively is so important. Most businesses have an account with at least one of the major social media sites and many of them use these to their best advantage but for the smaller business it can be a difficult balance to make it effective and engaging particularly if they are trying to do this work themselves. There are some common mistakes which can be avoided, take a look at the list below and make sure you avoid these yourself. 1) Not having a strategy. This is obvious, isn’t it? You should think before you act, and the same goes for marketing with social media as well. If you don’t have time to create a full strategic social media marketing plan, create a “napkin plan” at least. Make sure to clearly state your objectives (what exactly you want to reach) and steps how to reach those objectives. 2) Strategizing too much without experimenting. Another mistake is strategizing too much without experimenting. Any marketing specialist will tell you there is a lot of experimentation in marketing. Social media marketing is not an exception. Don’t write 100 pages of a plan for 3 months only to find out that half of the suggested strategies and tactics don’t work! 3) Posting only about your business. This is one of the most common mistakes that businesses make. Social media is all about sharing, don’t post only about your business, products, or services – people will get bored and you will lose a lot of targeted customers. 4) Posting only 3rd party updates. We often see businesses share only 3rd party updates or, in other words, curate the content. This is a great way to show your passion about your industry, but not enough to reach your target objectives, such as gaining new subscribers to your blog or generating news leads. Shared and own content should be mixed. With this in mind, when I find some really useful information on the web about how to ensure you get it right (or at least as right as you can) I am really pleased. So, when I came across this article I just had to share it with you. click the link to see the full article on PPC keyword types. https://www.serendipity-online-marketing.co.uk/wp-content/uploads/2015/03/SMO_logo-300x138.png 0 0 graham https://www.serendipity-online-marketing.co.uk/wp-content/uploads/2015/03/SMO_logo-300x138.png graham2013-06-12 15:33:042019-02-28 11:26:35The Ultimate Guide to Google AdWords Keyword Match Types? Most business wish to have their websites listed in the organic listings and in order to get there, a number of approaches need to be taken. Search engine optimization or SEO is one of the more important aspects and being able to understand how to work it is vital before you begin. Being able to make your website work at rising up the rankings is the goal and using tried and tested SEO methods will help you do this. Avoiding pitfalls as well as techniques that are either not permitted or that are a grey area is also essential. Two years ago, we released ”The Periodic Table Of SEO Ranking Factors.” Now we’re back with an update. We’ve introduced some new elements, adjusted a few rankings and given the table a more encompassing name, The Periodic Table Of SEO Success Factors. You can have an all singing, all dancing website but if nobody knows about it, it will not do your business any good at all. Marketing your website is vital and this should never be neglected in your online strategy, but how do you go about marketing a website? There are many ways of doing this and several aspects should be included in your strategy so that you attack from many fronts. This article is designed to introduce you to website promotion — getting consumers to come to your website. It gives you the basic information, which you can then explore through links to other resources, many of them free. No doubt you will be aware of the fact that blogging can be very useful in promoting your business and improving your online presence. However, it is important that you write a good blog so that it is not only interesting to your readers but also for the search engines. There are many techniques used in writing blogs and you will no doubt, have your own unique style. Blogging is not only informative but fun as well so make sure you enjoy what you are writing and hopefully, your readers will enjoy them too. Here are 21 tips on how to write a blog for your business blog in a step by step way. Below the how to write a blog for business graphic is a few tips on each step to help you get more clicks, more traffic and build your brand community. My father always used to lecture me of getting the foundations right, getting the research or work done so you know what your doing. As a teenager whilst that was good advice I often ignored it and learnt the hard way (luckily no serious damage was done only some minor accidents e.g. a tree house that fell down with friends and me in it), that this approach did make sense despite my impulse to just jump in and do it. If you want to learn how to write a blog then you need to understand your customers and write content that they are going to find useful and engaging. Do your homework and you will get more traffic, more click and more leads. But it does take time to get it right and for it to be on target with your customers. You need to prepared to make mistakes and learn from them. 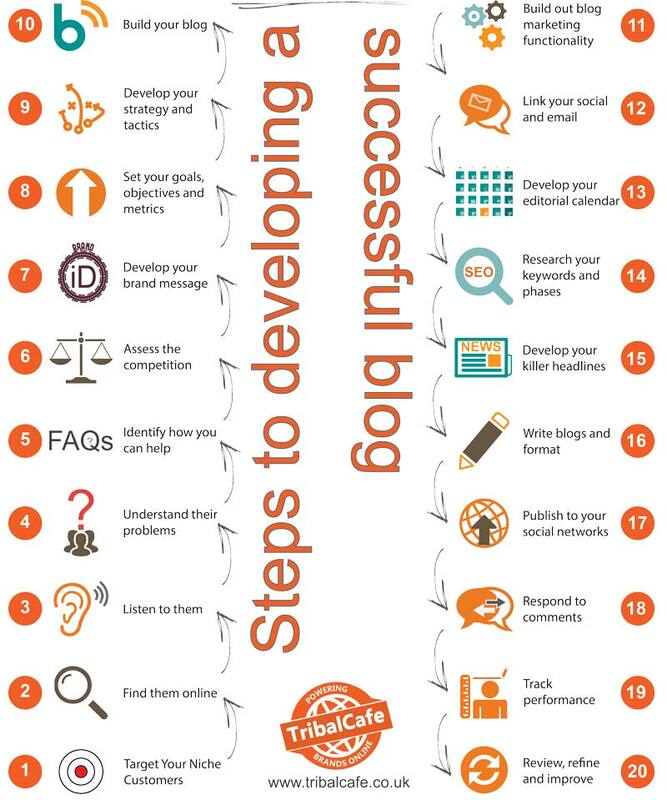 Here are 21 tips to help you write a blog for your business blog and get better results. When you are learning how to write a blog you can easily spread yourself too thin and you will not get the results you are looking for – staying focused is critical. Use marketing personas to build out who you are targeting and give them a personality. Use any data you have to support your marketing persona e.g. age, demographic data. Is your business guilty of these blogging mistakes? These days, attracting attention for your website and getting your message out there is crucial and there are many ways of doing this. Blogging and article writing are 2 very useful ways of achieving this. However, if you do not have a reasonable grasp of how written language works, you could find yourself in a bit of a mire. When I am reading something, I want to see something that is well written with good grammar and correct punctuation. The piece should have structure to it so that it flows. It does not matter how long or short it is, providing it reads well it will keep your audience interested.